A close up of the 'sarcophagus'. This is not a sarcophagus, of course. 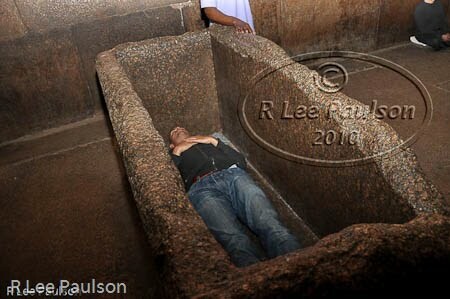 Compared to the outer sarcophagi found in real tombs of historical pharaohs, it's way too small--and the sides too thin. There is no room in this so called 'sarcophagus' for all of the inner coffins in which all other known pharaohs have been buried. It was obvious the minute I stepped into this room that we were looking at something other than a tomb. We've already talked about the properties of red granite, specifically that red granite has strong vibratory properties. 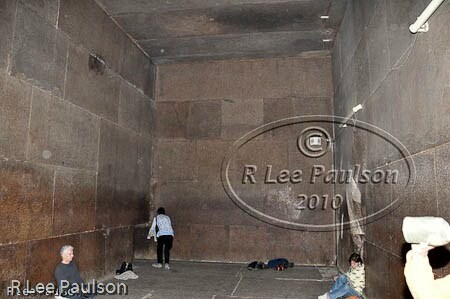 Indeed, the entire room, with it's red granite walls, floor and ceiling, rang like a bell. The echo from the walls is so strong in the King's Chamber that one must whisper in order to have any type of conversation. We each got to lay in the 'sarcophagus' and om while the rest of the group omed around it. When it was Melony's turn to get in, her female voice, amplified by the red granite of the 'sarcophagus", completely overpowered the rest of us, who, save for one other lower voiced woman, were all men. 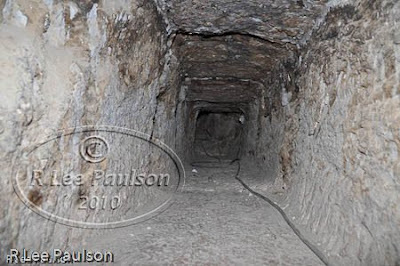 I am convinced that the 'sarcophagus' was a pitch control device of some kind and that this chamber was specifically designed to create specific sound properties. What they were, I cannot say. I am now standing up by the 'sarcophagus' looking back. Melony is leaning over to crawl out of the tiny exit hole. Which is another thing. 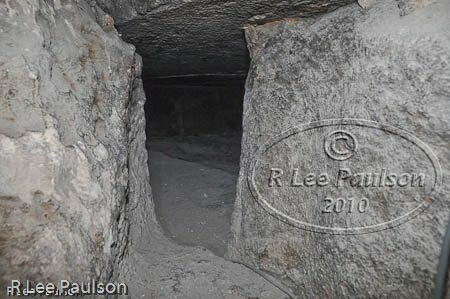 The entrance to this room is way too small for a pharaoh's inner coffins to be brought inside in one piece. 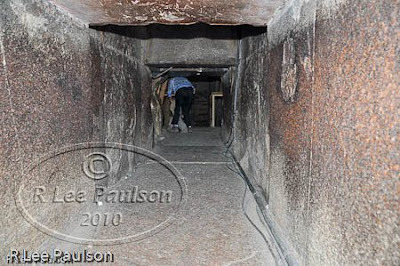 Remember also, that the grand gallery, through which one must traverse in order to get to this chamber, was blocked from the original entrance in ancient times by several huge red granite plugs. In 813 AD, Abdullah Al Mamum's men had to tunnel around them in order to gain access to the ascending tunnel that leads to the grand gallery. 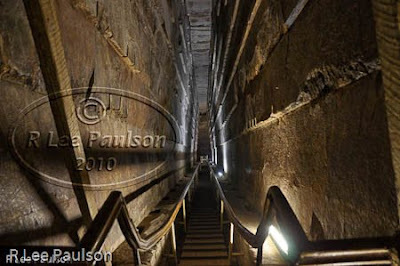 So, with the grand gallery's entrance blocked in ancient times, how would they have ever managed to get the pharaoh's coffin past those plugs? Let alone up through the tiny ascending passageway? According to West, "The floor plan of the room is a 2 x 1 rectangle, 34' 4" x 17' 2". The height of the Kings Chamber is 19' 1". This measure is not arbitrary, but is arrived at by taking one half the length of the diagonal of the floor. This seemingly simple operation is nevertheless mathematically significant. The diagonal of the 2 x 1 rectangle is the square root of five. The modern formula for the proportion called the golden section or Phi is 1/2(1 + √5)." Here Melony is stepping down into the grand gallery. West continues, "In the long debate over whether or not the ancient Egyptians knew the transcendental numbers Pi and Phi, the consistent use of measures derived from the diagonal of certain squares or rectangles amounts to conclusive proof that they were aware of the functions of diagonals. "We, in our modern mathematical language, call these transcendental numbers, but this is misleading. They are not numbers. Only that which can be enumerated is a number. "The diagonals symbolize the functions of creation itself...the King's Chamber expresses the argument between the religious view and the rationalist view of the cosmos stripped to its essentials. The religious view, expressed in terms of number, is one becomes two, and the whole of the universe is contained in that becoming, which is itself mediated by the proportion called the golden section, or Phi. "The King's Chamber may be seen by the symbolist as an almost miraculously effective illustration of that philosophy, wrought in granite monoliths. On the other hand, those who are disinclined to accept such a world view in the first place (and doubly disinclined to agree that the Egyptians held it two thousands years before Pyhthagoras elaborated it into a system capable of rational expression and passed it on to Plato) will want to see in the King's Chamber a simple burial chamber whose dimensions were merely a matter of expedience." There is the argument in a nutshell. A close up of the exit tunnel. 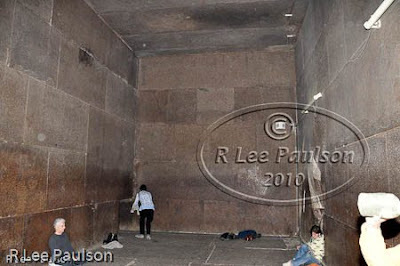 It turns out that anyone can get private time inside the Great Pyramid. There is a fixed price for two hours of time before the pyramid opens to the general public for the day and two hours after it closes. It cost us a couple hundred each, which we gladly paid. I was especially glad for the arrangement because they did not seem notice (or care) as I took my camera case inside. (I chose that camera case, by the way, specifically because it does NOT obviously look like a camera case.) Once the general public is allowed inside, the "No Photos Allowed" sign goes up and is rigidly enforced. The grand gallery. I had wanted to light this with my strobes in order to get a more constant color temperature in my lighting. But, we only had an hour on our own to explore the rest of the pyramid. After only a small amount of thought, I made the decision that my hour would be better spent exploring the entire structure than getting one 'perfect' image of the grand gallery. So, here, with no apologies, is the best image I got from ground level up by the King's Chamber. That tiny hole at the end of the rails, 150 some odd feet away, is the exit to this chamber. As mentioned before, it is another short, narrow tunnel. You have to look carefully in order to see it. Immediately behind me when I took the previous photo, a ladder had been installed that leads up to the chambers above the king's chamber. If one looks carefully in the previous photo one can see bracing for the ladder to the immediate left and right leading up behind me. West said that in the twenty years he has been bringing private groups in, he hadn't seen a ladder in place like that. Naturally, we took the opportunity to explore. So, clutching my good sized camera with its attached SB900 flash in one hand, my flashlight in the other hand, and my briefcase sized camera bag over my shoulder, I clamored 28 feet up the rickety ladder, eased my self off at the top and crawled through this tunnel, cut through the rock by Nathaniel Davison, in 1765. To give you a reference about the size of that tunnel, on my hands and knees, my back brushed against the top. 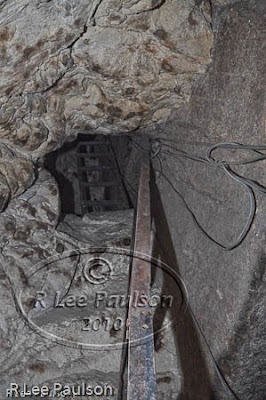 The tunnel opened onto a small cavity with a ladder and a tiny exit hole at the top. Notice the red granite ceiling joist directly above the ladder. I didn't notice that while I was on this ladder. There were no lights up here, so I got this picture and the ones that follow by setting my camera and flash on auto and firing them off into the pitch black darkness, hoping for the best. Climb through the hole and up another ladder, which you can see in the previous picture if you look closely, and one gets to the first relieving chamber, called Davison's Chamber. It appears from all the debris and supplies that work is going on in this chamber. 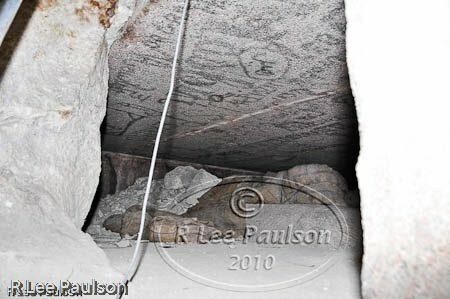 Notice all of the graffiti on the ceiling. 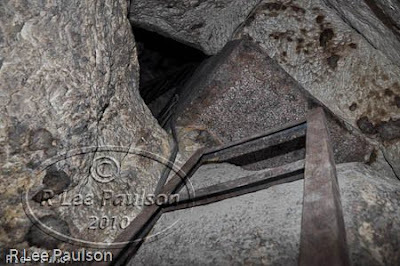 If one looks closely one can make out some of the individual red granite joists. There are a total of five relieving chambers above the King's Chamber. I continued working my way up, climbing the steep ladders with one hand (the one holding the flashlight) and clutching my camera with the other. Howard Vyse, in 1837, created these passageways by blasting in his efforts to find the remaining chambers. 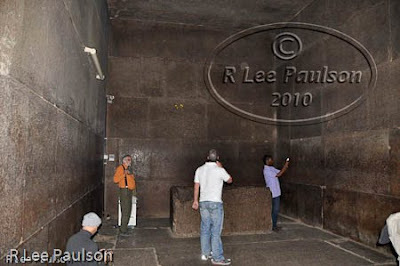 Only a rare, privileged few have had the opportunity to enter into these chambers, let alone photograph them. So, it is unlikely images like this will be seen in many other places. We were beyond lucky. Next time, we continue climbing inside the Great Pyramid. Continue on to Post 40: Great Pyramid II by clicking here. 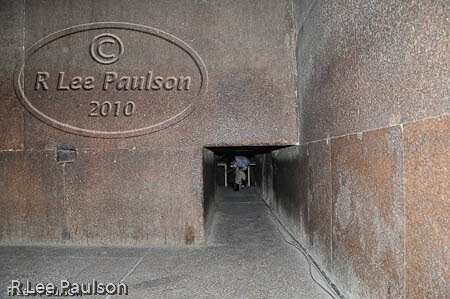 Have you a photography of the interior of the passage between Davison's chamber and great Gallery ? I am planing on going to the pyramids, but last thing I want is to be frog marched into the pyramid in a queue, surrounded by other people. Understandably, it may be going too far to want the place to yourself, but was your experience a one off or is it a common practice? @Philippe: The photo directly below the grand gallery is of that passageway. @Anon: Specific individuals have made arrangements for private time in the Great Pyramid as part of their tours. I suggest you contact Anthony West and travel with him. That said, we visited before the revolution. Am not sure if the same contacts that worked then work now. I am usually quite a get up and go traveller and i planned to go from the pyramids to the swia oasis back in 2011/12 but the place was a little to unstable. (oddly enough my back up fell through when I was about to book tickets to go to japan and then the tsunami and such happened) Either way i ended up in south east asia for the floods in thailand and then the series of after quakes in christchurch. Can you give any more info on Anthony West... afraid I am a little lost as i am not familiar with this name? But all the same really appreciate it,and seems you had a great time. Turns out I do know the name, just had no idea he did tours! Thanks for putting me on to that.